It is easy to regard our parish church as the greatest expression of antiquity in the village. The fields which surround us are far older, going back, probably, to pre-Saxon days. They had been cleared with immense effort from the forest. They survive in the village as our Greens. Through the earlier woodland clearings passed Neolithic man. He left signs of his presence by his stone and flint implements, which have recently been picked up 4000 years or so after he discarded them. Some have been found in the Lodge fields, high well-drained ground, with the advantage of water from the Little Cam, and the type of ground which he favoured, though his occupation site or chipping-floor have not been found. The old village, apart from Church End, formed roughly three sides of a square between Crow Street, Chickney Road and Wood End, and to the south enclosed fields which from their heterogeneous shapes, suggest early enclosure direct from the forest: as one looks across from the Glebe towards Chickney, the view of woods and fields cannot be very different to the later medieval times. Commencing from the Domesday Survey of 1086, from the Saxon manors of the Broom to the southwest, Pledgdon to the southeast, and Henham Hall in the centre of the present parish, intermixed cultivation gradually spread over the whole area. Eventually there were at least eleven large Open or Common Fields; Howe Common, Great Hide and Small Hide to the southwest of the village; Platts Common, Sandhill (or Sandal) and Outfield to the east and south; to the north bordering on High Wood, Brockley Common; bordering on Prior’s Wood, East Common and Common Fen; to the north-west, Ash Common and Middle Croft. To the north of Henham is the old parish boundary of Widdington Woods; a ditch, a bank, many hornbeams and pollards show its antiquity; the woods may well be of the original forest. To the east the curved field boundaries of Debden and Chickney, dated as Saxon boundaries by the Landscape Section of the Essex County Council this year. The Henham Lodge fields have a different history to that of the other farms. Norden’s map of 1594, from the Cecil M.S.S. at Hatfield House marks Henham Lodge, and a Hall surrounded by a palisaded deer-park. The deer-park and the great Tudor house of the Earl of Sussex were previously thought to be near the site of the FitzWalter house by the Moat. This newly-interpreted map evidence is being closely investigated by John Hunter and Gareth Roberts, both on the spot and by documents, and the result of their work in Henham this summer will soon be forthcoming. The County is preparing a booklet on the historical evolution of the Essex landscape, and Henham is proud to have been selected as a case study of a typical parish on boulder clay. Some of the names of the Common Fields - Estfeld, Owtefeld and Howfeld - are mentioned in the 1572 Court Rolls, and reappear as East, Outfield and Howe Commons in the Tithe Award (1840) and the Enclosure Map (1850). In a 1530 Tudor Survey of Henham the land is mentioned as “highe and dry champyon ground”, that is, the open field, the ‘˜champagn’. (F-L). The great fields (not to be confused with common or waste land) were farmed, communally, in scattered strips, of half an acre or less. The allocated strips, worked by one owner or tenant, were often at a considerable distance from one another, as more land became available, or more was taken in by direct enclosure from the woodlands. Man-made cultivation replaced the old wild land and scrub. The Common Fields of northwest Essex, on the edge of the great Midland open field system, were not enclosed till very late; the reasons for this are obscure. In Henham, it was not until the middle of the nineteenth century that 630 acres of arable land were enclosed, and the Enclosure Map of 1850 shows the hard, straight’ boundaries mapped by the Parliamentary Commissioners. Yeoman farmers, and cottagers, were allotted compact blocks of land instead of holdings of scattered strips. As long ago as the thirteenth century agreements mention fragmentary portions lying about in various fields - “which lie in the field towards Brum”, and “which lies in the field called Ho, next to the land of William the Reeve ! In the Common Fields a totally different pattern emerged to the individually enclosed fields with their uneven boundaries. The Tithe map of 1840 shows the old narrow strips of cultivation in an open field - numbered and awarded to different owners. The method of ploughing in furlongs gave ridges or furrows between the strips, and the turning of the “ox team marked the shape of a long reversed S, visible in the Tithe Map. This curved ox plough line appears in Howe Common, to the west of the village (could this be “the field called Ho”, mentioned in 1214 ? and Great Hide Common, bounded by Mill Road. Southwest of the old mill site on Small Hide Common, the Enclosure Map of 1850 shows the hard straight boundaries of the parliamentary surveys, when 630 acres are taken in, and farmers were allotted compact blocks of land instead of scattered strips. Carters Lane appears as Occupation Road in a conveyance map of 1878 (kindly lent by Mr. J. Pimblett). It was probably a field balk or raised path along which farm workers went to and from their occupations at Pledgdon Hall, and used to have a hedge each side; the surviving one to the west is very old. The Tithe Award of 1840 lists the names of owners and tenants with numbers referring to dwellings, fields or strips on the Tithe Map, and of all the means of research, these are the most valuable. With these numbers, which re-appear on the Enclosure Map of 1850, field names are given, but even so, with boundary alterations, many names cannot now be traced. A Conveyance, May 1850, (owned by Mr. J. Pimblett, Parsonage Farm, Henham) to Joseph Baxendale, Lord of the Manor, when compared with the 1st Edition Ordinance Survey,” 25″, 1877, shows that within those twenty-seven years, Henham Lodge Farm, to the northeast of the parish, lost at least eight of its fields by the removal of hedgerows. Coneygar and Little Coneygar, Parsonage Farm probably where rabbits were reared for the use of the Lord of the Manor. Ley - where often stock was tethered instead of free-grazing. Calves Pightle - calves enclosure, and a piece of elongated land left over after it had been divided up for strip cultivation. The Croak - (from the Old English cruc, land by a cross) adjoining the churchyard, suggests the 13th century Church of St. Mary the Virgin is on the same site as the earlier Saxon Church known to have existed (M.S.FF.2.33,f.49 Cambridge University Library). Traditionally the ground in Hall Croft immediately to the west of the churchyard wall was known as the Croak. Old maps of about 100 years ago, and local knowledge, indicate a line of trees (walnuts) diagonally across Hall Croft, from the site of the Hall by the Moat to the church. Hall Croft, Parsonage Farm - the site of a deserted medieval village discovered by John Hedges, Essex County archaeologist in February 1973, links up with the Domesday Survey of the Hall, which was the home of the FitzWalter family for many centuries. Hall Field, Little Hall Field, and Great Hall Field, are to the North. As well as the old crops of grass, wheat and barley, saffron and hops were grown in the fields to the north. Park Spring, Park Spring Meadow, Park Hill, Park Hill Meadow, and Round Park, all in the Henham Lodge fields, indicate the position of a Tudor park, sited as “a myell” from the town of Henham in 1530, though the great house of Thomas, Earl of Sussex, has vanished without trace. Bury Hill, sometimes Berry Hill, (1769) to the northeast of Pledgdon Hall. Probably of great antiquity, deriving from burh, (Anglo Saxon or Danish borg, a fort: castle), and part of the former demesne land of the Saxon manor of Pledgdon or Plicidana. Hagger Bush, and Lower and Upper Ruggers, near Pledgdon Hall; names showing Danish influence, and in 1572, abutting upon “le Dane”. Common Fen, at Little Henham, was communal mowing land, and adjoins a lane recently designated by the County as a protected lane of national importance. Along the lane, to the east of Beggars Oak, Balk Town Field (where a balk runs down from Brayshott) to the top of Newcroat Hill are the high banks or lynchets associated with the boundaries of Common Fields. The opening of the Northern & Eastern Railway on to Newport, in 1845, on the western boundary of Henham, brought relatively little disruption: by 1850 it belonged to Eastern Counties Railway; it brought wealth to Old Mead Farm, where it passed through six fields, altered no names, and where life went on as before with horse power. In 1862 E.C.R. became the Great Eastern; in 1923 it was absorbed into the London and North Eastern Railway, and in 1948 was superseded by the Eastern Region of British Railways. The single line Elsenham and Thaxted Light Railway (1913 - 1953) has not been mapped. In 1946, by a. 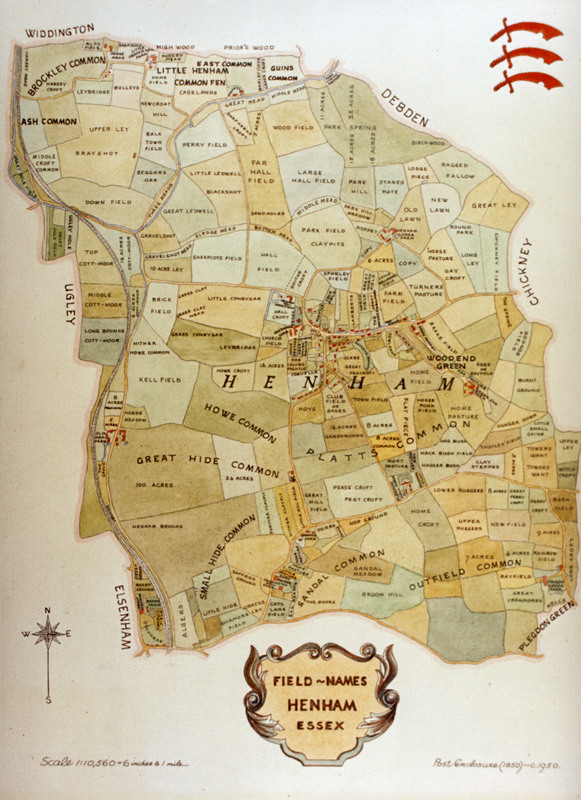 Ministry of Health Order, the old Broom Manor of Henham, shown on the map to the west of the railway, became part of the parish of Elsenham. After the sale of 384 acres of land at Old Mead Farm in 1931, there was a small amount of building on Great Hide Common. The last Council houses, on Parsonage Farm land, were built in 1949. Otherwise there was little building in Henham until after 1950. 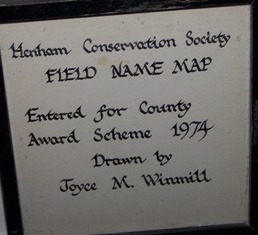 A set of aerial photographs, taken in 1946, show its undisturbed fields, reflected in the Field Name Map. With the removal of war-time restrictions, building recommenced. Farming land was built over by developers. The survival and location of many field names were endangered, and are now passing out of the knowledge of the old agricultural parish. Insidious erosion and changes took place their impact not realised till later. A new landscape emerged in Henham. In 1930 the Common was a name frequently used; now it is never heard, and to newcomers, unknown. Since 1950 thirty-six houses have gradually been built over Great Hide - not one of them perpetuates the name. The Orchard, in the centre of the village, became Highfields in 1962 with three houses. The field of Hoys became Vernons Estate in 1964 with seventy-two houses. Duckett’s Pasture became Hall Close, from its proximity to a modern village hall in 1964, with six houses. Tom King’s Field became Wright’s Piece in 1969 with five houses. Turner’s Pasture, one of the very earliest of Henham field names - “half a virgate of land called Turnoures in the tenure of John Turnour (1432, Calendar of Close Rolls, E.R.O.) became 1 - 9 Chickney Road, in 1972. Sheepcote Lane speaks for itself, and extensive sheep farming continued at Henham Lodge in the early nineteenth century. Later events have been the intrusion of pylons for the 132,000 volt transmission line in 1959, and the 400,000 volts line in 1964. Roses were grown for a grower in 1967-68, making a beautiful bit of colour: Artichokes in 1968-70, until they were killed by a severe frost. Charolais cattle imported in 1962 have resulted in the first breeding of a pedigree in England - Henham Lodge Honeysuckle - in 1972. With increased mechanisation, a two-way migration took place: farm workers to the towns, and towns people to the country - sometimes a forced migration, through shortage of small houses in a village where a family had lived for generations, and population increase in urban areas. From the 1861 census, (P.R.O.R.G.9/ 808) at Parsonage Farm, there were 17 men and 12 boys, - in 1974, 6 men. At Henham Lodge, there were 24 men and 15 boys, - now 4 men and 1 woman. At Pledgdon Hall there were 15 men and 9 boys, - now 7 men and 2 women. In all, on the nine farms then in the parish, with a population of 875, there were 194 agricultural workers and 4 shepherds. Now with the latest population figures of 1,156 there are approximately 22 agricultural workers. Fewer men on the farms and larger machinery have meant loss of boundaries and hedge-rows; many boundaries of hedges and ditches have been lost and two or more fields can now be ploughed right across. If a village loses its fields visually, it need not be even more impoverished by the loss of their names. Discoveries, maps, and documentary evidence all stress that the foundations of our country scenery is working farmland. Henham is now almost an urban community, but still surrounded by fields) farmed by modern mechanised methods on privately owned land. Still the landscape of food production as for centuries past. Still lovely fields, largely unexplored and almost foreign land to many newcomers. The country round Henham was an expression of the life of the village. It is so no longer. It sank deeply into the consciousness of every man, woman, and child, and determined their material fortunes for good or ill.
TITHE 1. E.R.O. (D/CT.176). 1840, and Apportionment E.R.O. (D/CT.176a). 1840. Enclosure Map. E.R.O. (RDc.43a). 1850. Sketch Map, Wood End Farm, Henham. 1849, from the original owned by Mr.
Thomas Baxendale, 3.New Square, Lincoln’s Inn. Conveyance Map. 1850. Owned by Mr.J.Pimblett. Parsonage Farm, Henham. Ist.Ed. Ordnance Survey, 25″, 1877. University Library, Cambridge. People and the Countryside. H.E.Bracey. Routledge & Kegan. 1970. It is easy to regard our parish church as the greatest expression of antiquity in the village. The fields which surround us are far older, going back, probably, to pre-Saxon days: they had been cleared, with imnlense effort, from the forest: they survive, in the village, as. our Greens. Through the earlier woodland clearings passed neo-lithic man, leaving signs of his presence by his stone and flint implements, which have recently been picked up, 4000 years or so after he discarded them. Some have been found in the Lodge fields, high well-drained ground, with the advantage of water from the Little Cam, and the type of ground which he favoured, though his occupation site or chipping-floor have not been found. The old village, apart from Church End, formed roughly three sides of a square between Crow Street, Chickney Road and Wood End, and to the south enclosed fields which from their heterogeneous shapes, suggests early enclosure direct from the forest: as one looks across from the Glebe towards Chickney the view of woods and fields cannot be very different to the later medieval times. In N.W. Essex, Qn the fringe of the midland open-field area, there is unusually late evidence of the strip method in farming. In Henham there were at least eleven large Common Fields; Howe Common, Great Hide and Small Hide to the west of Mill Road going down to Elsenham: Platts -Common, Sandhill and Outfield to the east and south: to the north, bordering on Jock Wood, Brockley Common: bordering on Priors Wood, East Common and Common Fen: to the west, bordering on North Hall Road, Ash Common and Middle Croft. As long ago as the thirteenth century agreements mention fragmentary portions lying about in various fields - “which lie in the field towards Brum”, .and “which lies in the field called Ho, next to the land of “William the Reeve “. In the Common Fields a totally different pattern emerged to the individually enclosed fields with their uneven boundaries. The Tithe map of 1840 shows the old narrow strips of cultivation in an open field - numbered and awarded to different owners. The method of ploughing in furlongs gave ridges or furrows between the strips, and the turning of the ox team marked the shape of a long reversed S, visible in the Tithe Map. This curved ox plough line appears in Howe Common, to the west of the village (could this be “the field called Ho”, mentioned in l2l4?) and Great Hide ‘Common, bounded by Mill Road. South west of the old Mill site on Small Hide Common, the Enclosure Map of 1850 shows the hard straight boundaries of the parliamentary surveys, when 630 acres were taken in, and farmers were allotted compact blocks of land insteadof scattered strips. Carters Lane appears as Occupation Road in a conveyance map of 1878 (kindly lent by Mr. J. Pimblett). It was probably a field balk or raised path along which farm workers went to and from their occupations at Pledgdon Hall, and used to have a hedge each side; the surviving one to the west is very old. .
Another illustrative land name occurs near the church; traditionally the ground in Hall Croft immediately to the west of the churchyard wall was known as the Croak. The Old English cruc means land by a cross, and suggests the site of our church was hallowed by a verj early cross. Old maps of about 100 years ago, and local knowledge, indicate a line of trees (walnuts) diagonally across Hall Croft, from the site of the Hall by the Moat to the church. To the north of Henham is the old parish boundary of Widdington woods; a ditch, a bank, many hornbeams and pollards show its antiquity; the woods may well be of the original forest. To the east the curved field boundaries of Debden and Chickney, dated as Saxon boundaries by the Landscape Sec ion of the E.C.C. this year. The Henharn Lodge fields have a different history to that of the other farms. Norden’s map of 1594, from the Cecil M.S.S. at Hatfield House, marks Henham Lodge, and a Hall surrounded by a palisaded deer-park. The deer-park and the great Tudor house 6fthe Earl of Sussex were previously thought to be near the site of the FitzWalter house by the Moat. This newly interpreted map evidence is being closely investigated by John Hunter and Gareth Roberts, both on the spot and by documents, and the result of their work in Henham this summer will soon be forthcoming. The County is preparing a booklet on the historical evolution of the Essex landscape, and Henham is proud to have been selected as a case study of a typical parish on boulder clay. The historical significance of Norden’s map is borne out by the nineteenth century names of five of the Lodge Farm fields - Park Spring, Park Hill, Park Field, Little Park Hill, and Round Park. Another interesting feature of our landscape to the N.E. is shown when comparing a Conveyance Map of 1853 (also lent by Mr. J. Pimblett) when the Manor was sold to Joseph Baxendale, with the First Ordnance Survey of 1877; in between those years Henham Lodge lost at least eight of its fields by the removal of hedgerows. A deserted medieval village site was discovered at Hall Croft, Parsonage Farm, by the County Archaeologist in February of this year. This exciting discovery will be discussed, and will, we hope, form part of a lecture from John Hedges to the Society in March 1974. As well as the old crops of grass, wheat and barley, saffron and hops were grown in the fields to the north. Sheepcote Lane speaks for itself, and extensive sheep farming continued at Henham Lodge in the early nineteenth century. Later events have been the intrusion of pylons for the 132,000 volt transmission line in 1959, and the 400,000 volts line in 1964. Roses were ~rown for a grower in 1967-68, making a beautiful bit of colour: artichokes in 1968~70, un.til they were killed by a severe frost. Charolais cattle imported in 1962 have resulted in the first breeding of a pedigree in England - Henham Lodge Honeysuckle - in 1972. Discoveries, maps, and documentary evidence all stress that the foundations of our country scenery is working farmland. Henham is now almost an urban cummunity, but still surrounded by fields) farmed by modern mechanised methods on privately owned land. Still the landscape of food production as for centuries past. Still lovely fields, largely unexplored and almost foreign land to many newcomers. The country round Henham was an expression of the life of the village. It is so no longer. It sank deeply into the consciousness of every man, woman, and child, and determined their material fortunes for good or ill.